CSA 2015 – Final Week! 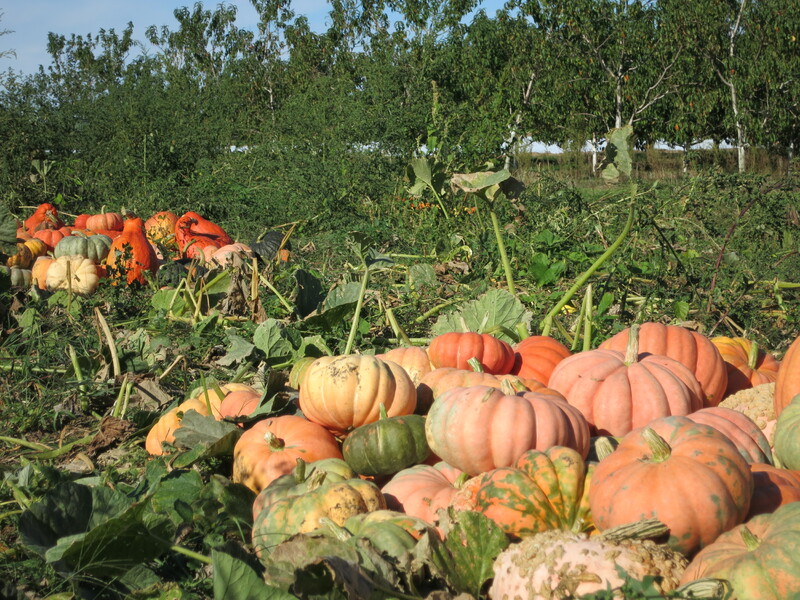 Our last big crop of the season is squash & pumpkins. 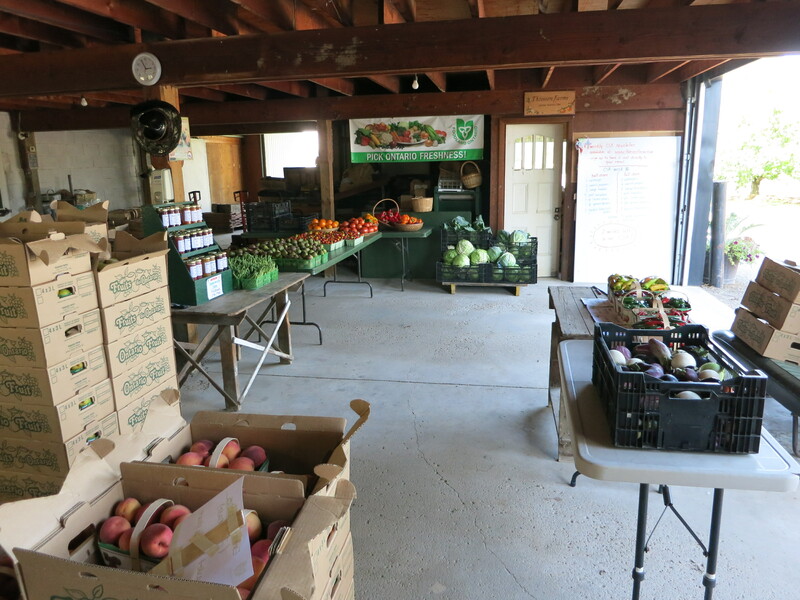 Most of them are now in bins in the barn & ready for selling – and eating! 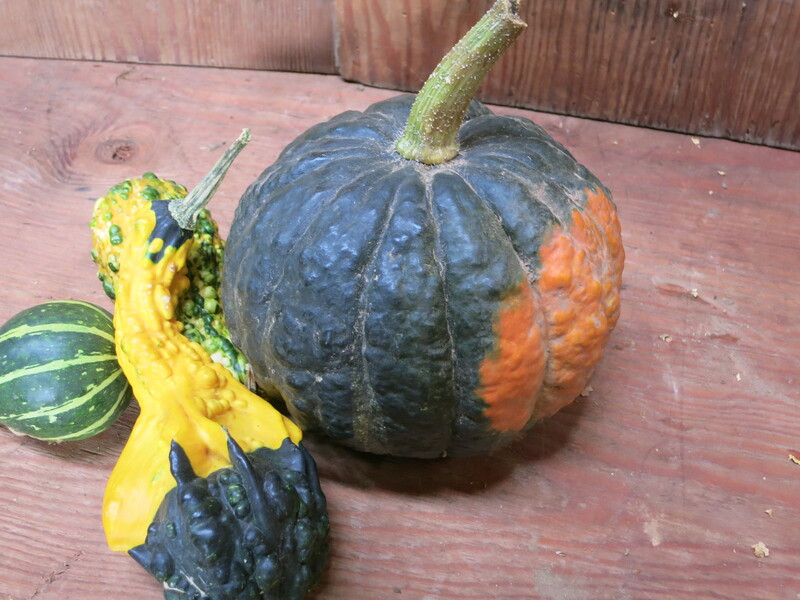 This year we grew about 30 varieties of squash & pumpkins. We choose as many colours & shapes as possible to make for an eye-catching display at market. And of course flavour is very important! There isn’t enough space on our farm to grow a lot of any of these – just enough for CSA & our farmers’ markets. 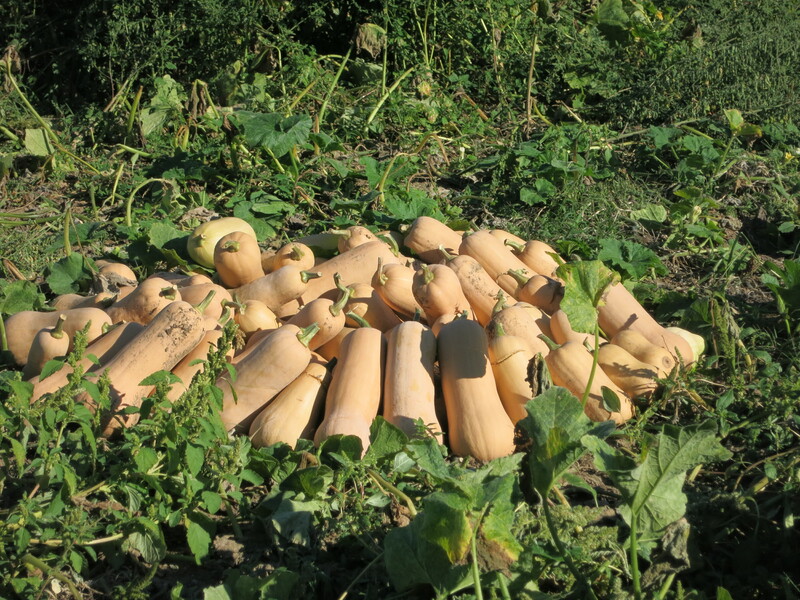 Butternut – everyone’s favourite squash. Rich orange flesh with a nutty flavour. We grew 5 different kinds of butternut – various sizes. Black Futsu -bright orange flesh with the flavour of hazelnuts. Sunshine – a beautiful, bright orange squash (inside & out) with a sweet & somewhat dry texture. Sunshine are great for pies, baking & mashing. Blue Hubbard (heirloom) – an old variety that is large, yellow-fleshed, somewhat dry, and not too sweet. 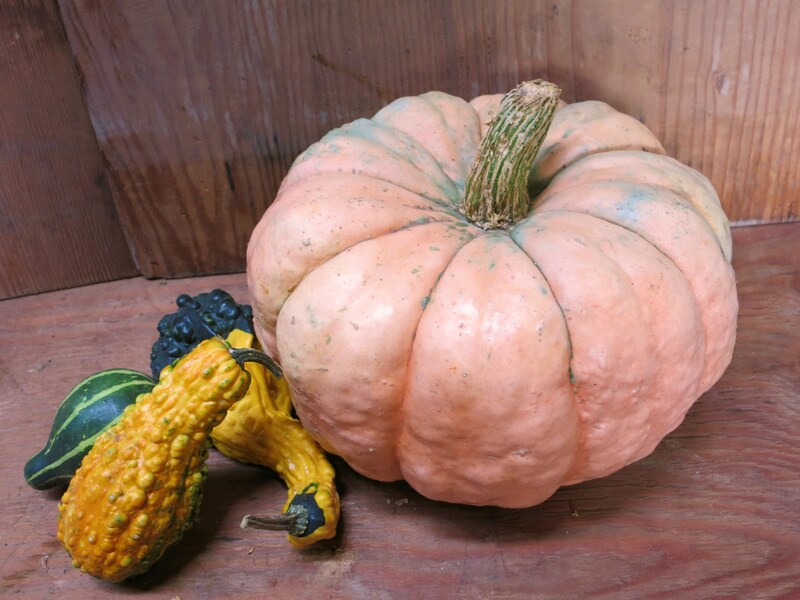 Thelma Sanders Sweet Potato (heirloom) – a small, sweet, tasty, acorn squash. 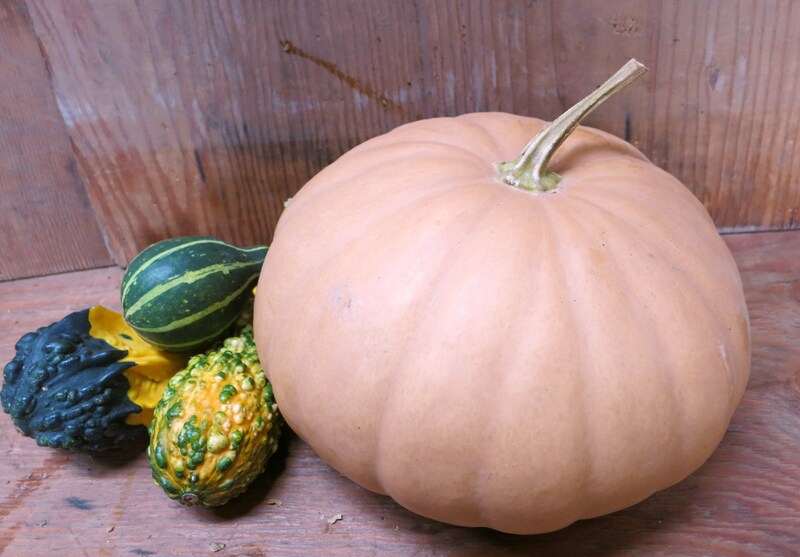 Jarrahdale (heirloom) – a beautiful, slate-grey, high quality, delicious pumpkin. 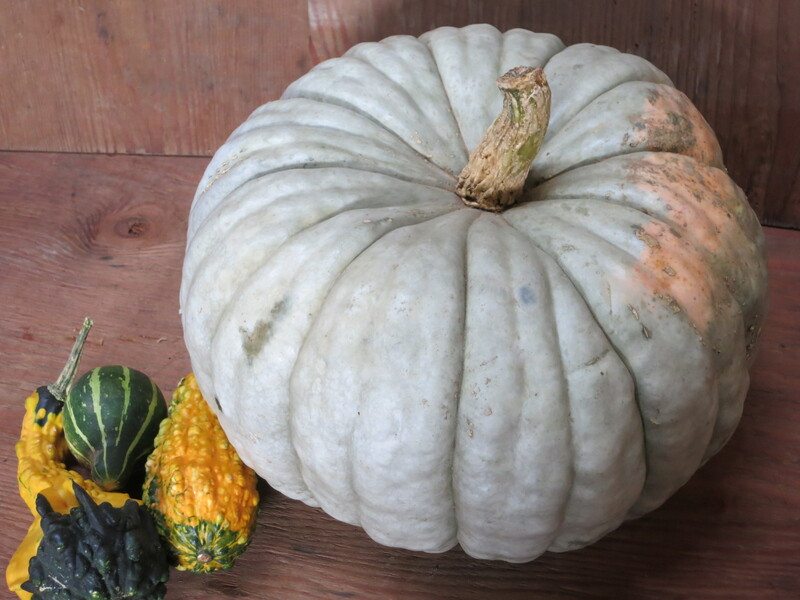 Long Island Cheese (heirloom) – tasty pumpkin that looks like a wheel of cheese. Boston Marrow (heirloom) – large, dry & sweet, with good flavour. 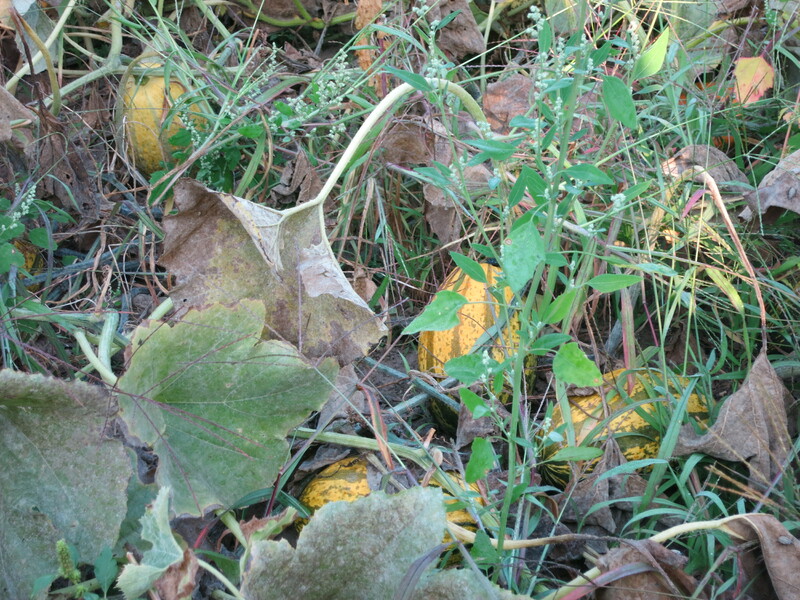 North Georgia Candy Roaster (heirloom) – a long, banana shaped squash with sweet, orange flesh. 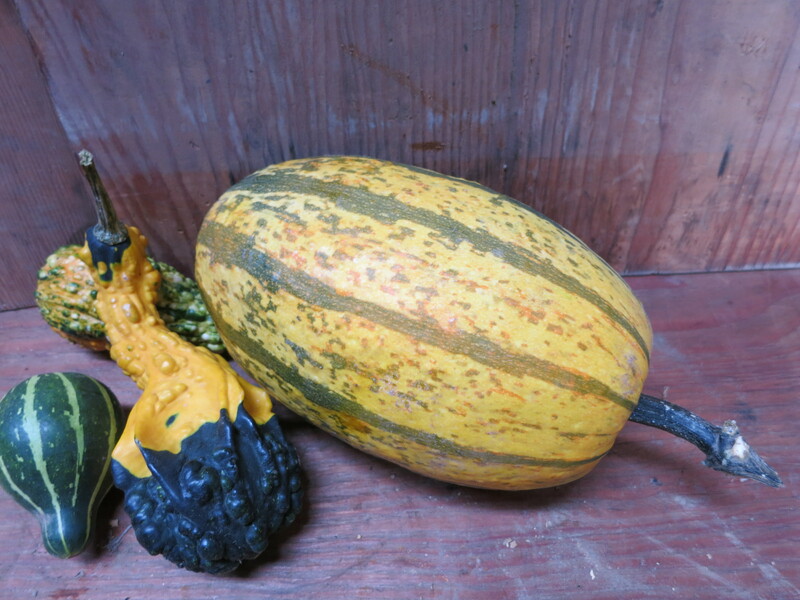 Moranga (heirloom) – a pink to salmon coloured squash from Brazil used to make a traditional “camaraona moranga” or shrimp in a squash. Tetsukabuto – deep yellow flesh with a sweet, nutty flavour & smooth texture. Stripetti – a spaghetti/sweet potato cross. The flesh is stringy like spaghetti! More flavour than a plain spaghetti squash. 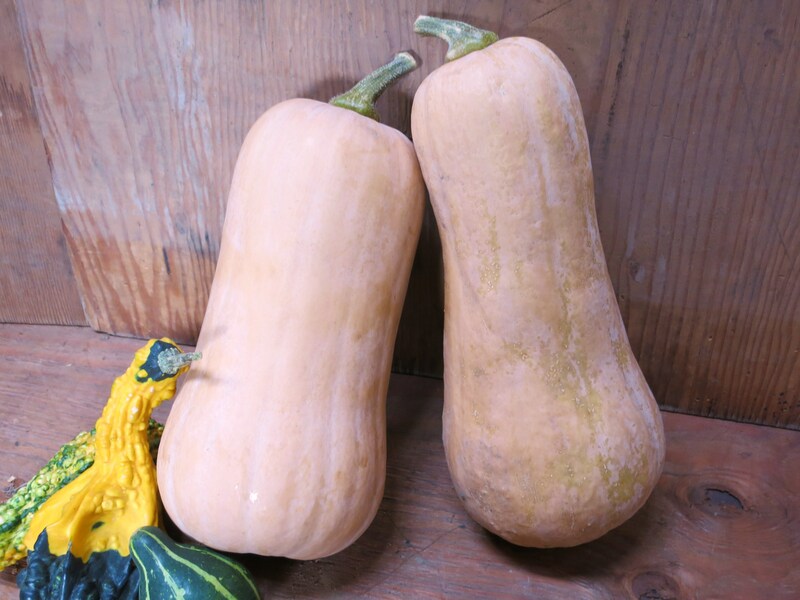 Australian Butter (heirloom) – beautiful, peach coloured squash from Australia with good flavour. 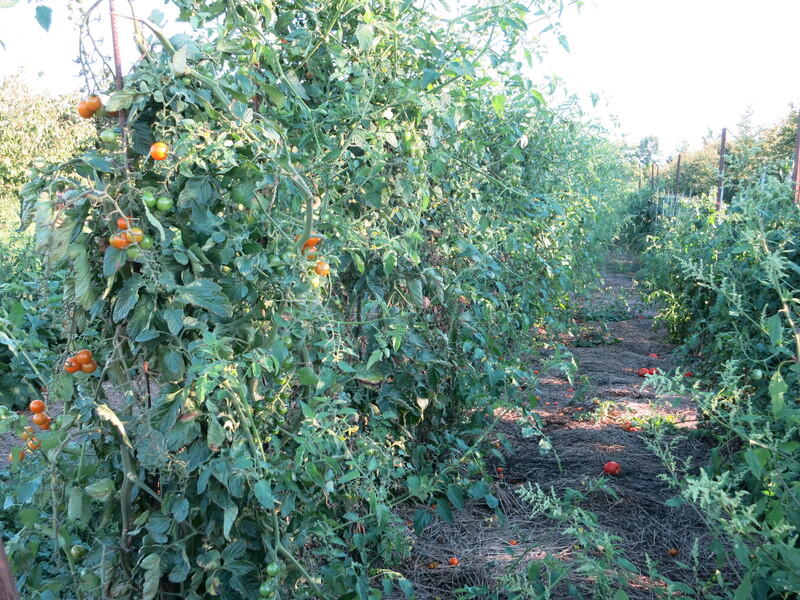 Musquee de Provence (French heirloom) – The flesh is deep orange, rich & moderately sweet. The outside turns a rich brown colour as it ages. 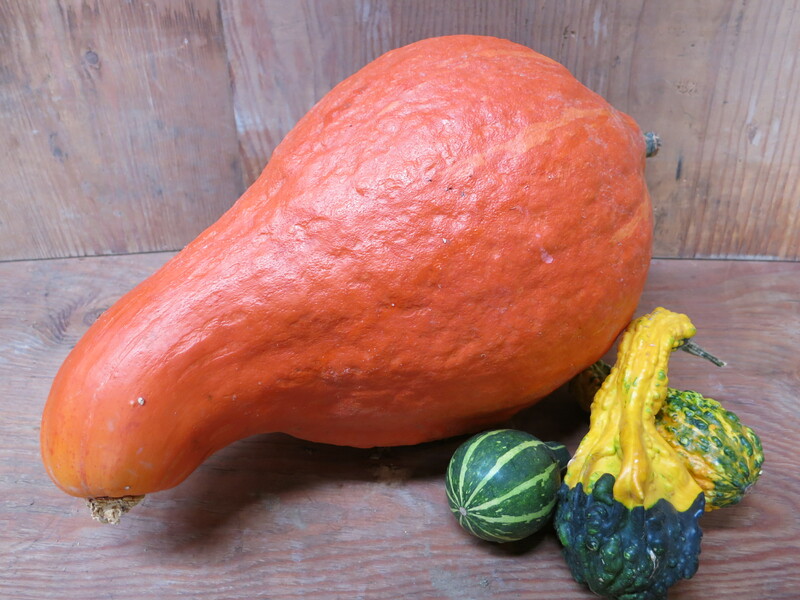 Red Warty Thing or Victor (heirloom) – gorgeous, red-orange, large squash covered in bumps. 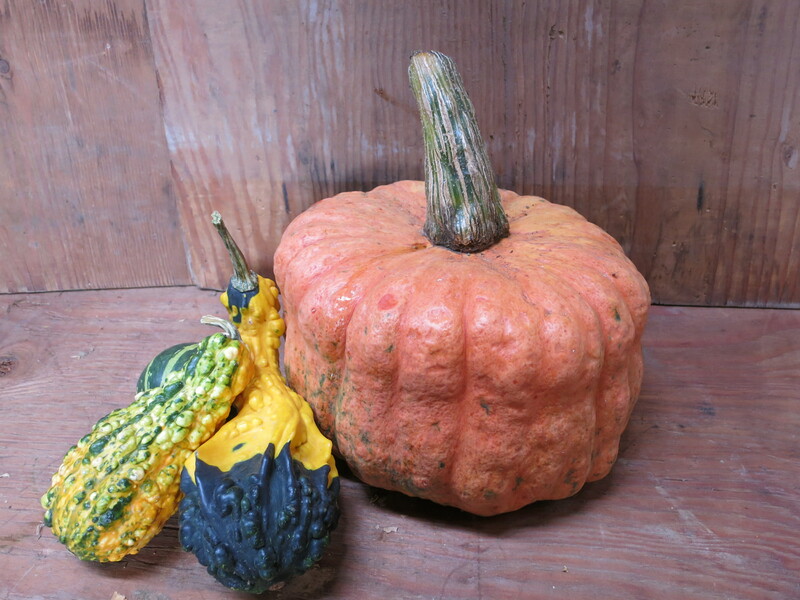 Galeux d’Eysines (heirloom) – commonly called “peanut” squash. 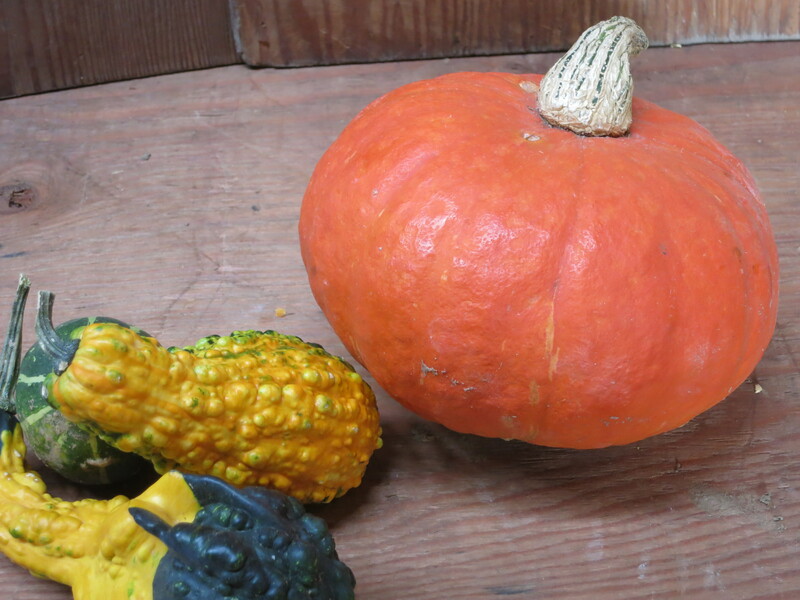 A pale pink squash covered in warts or peanuts, & used for soup in France. 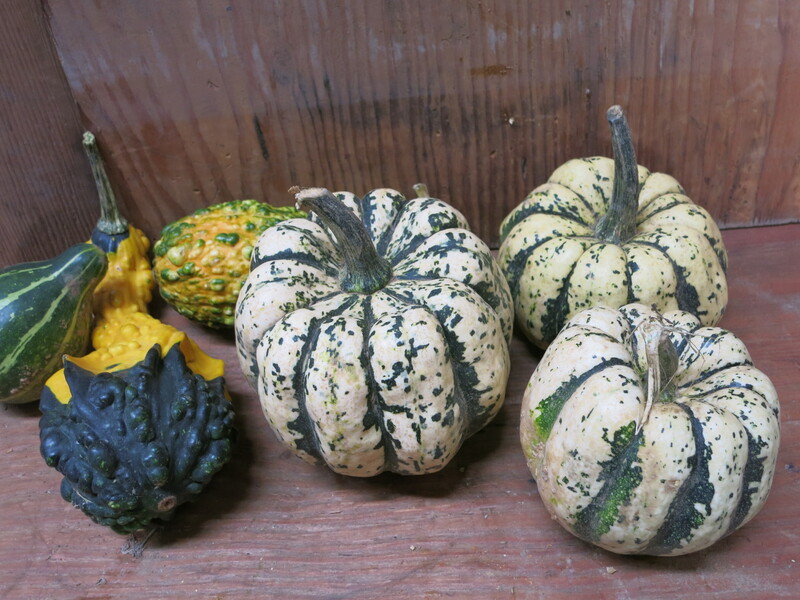 Sweet Dumpling – small, individual sized squash with very sweet, moist, yellow flesh. 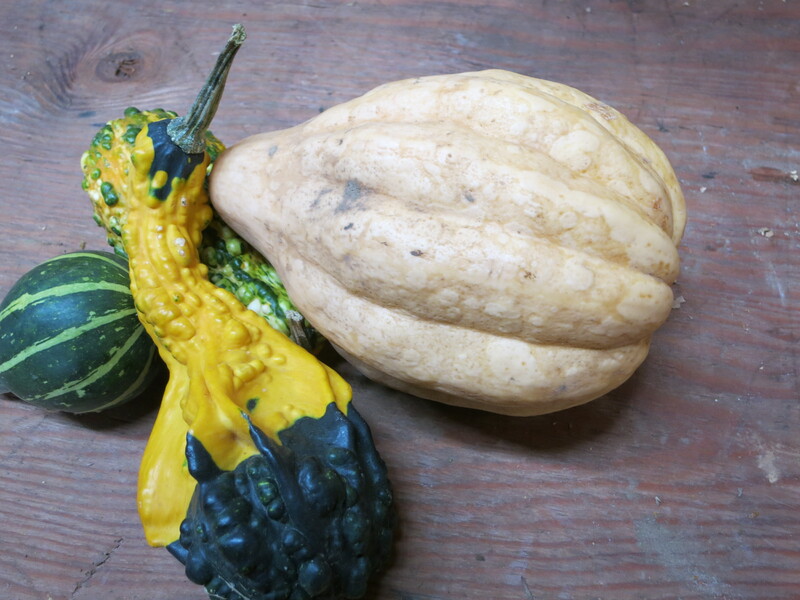 Mini-squash – Honeynut (mini butternut), Gold Nugget (mini orange hubbard) & Shokichi Shiro (mini kabocha). Squash, Bosc pears, tomatoes, sweet peppers. extras – hot peppers & Bartlett pears. 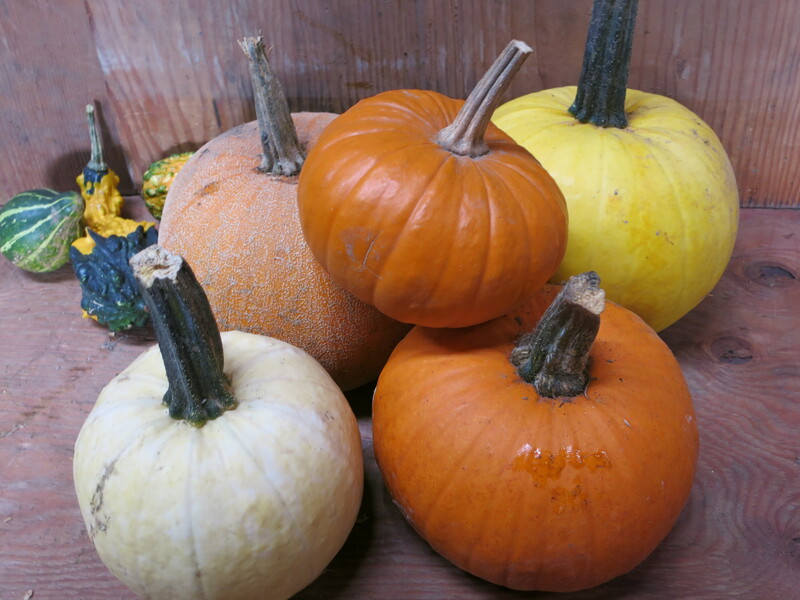 Your choice of a few squashes this week! 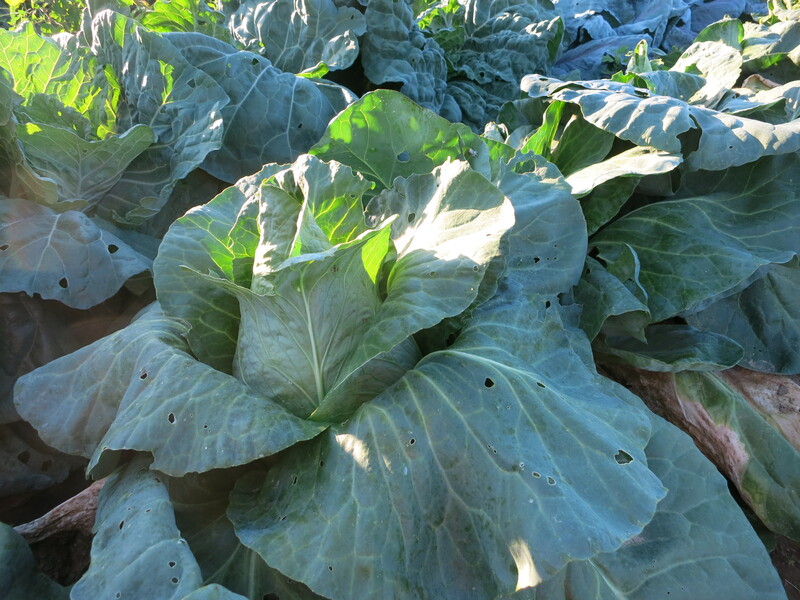 Not all the varieties listed above will be available – but there will be a good selection! 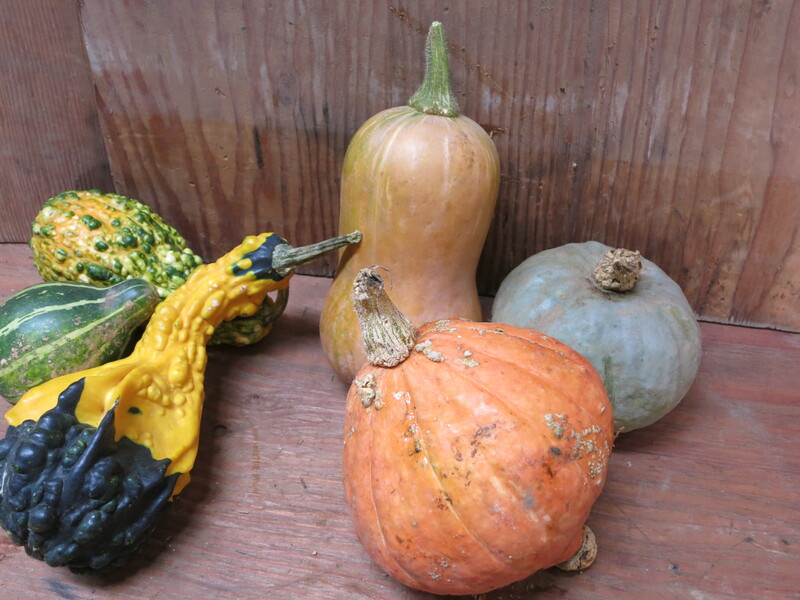 Squash can be stored for a few weeks & up to several months for some kinds. It is important to keep them dry & cool. The easiest method (& our favourite way) to prepare squash is to slice it in half, scoop out the seeds and bake it – usually at 350 C. until it is soft when poked with a fork (approx. 45 minutes to an hour depending on size). Bake it cut side up or cut side down – it really doesn’t matter. Then scrape the flesh out of the skin, mash & enjoy. You can add brown sugar or maple syrup if you prefer a sweeter squash, or just salt & pepper. The Bosc pears in your box are still very hard & green. 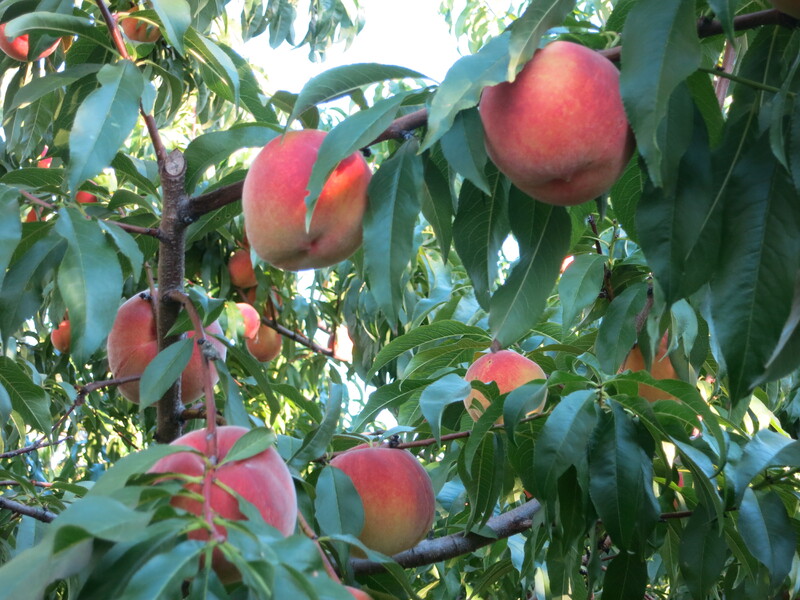 They will take more than a week or 2 to ripen. Bosc are at their peak for eating when they begin to turn a golden brown colour. If kept refrigerated, they will last until Christmas. 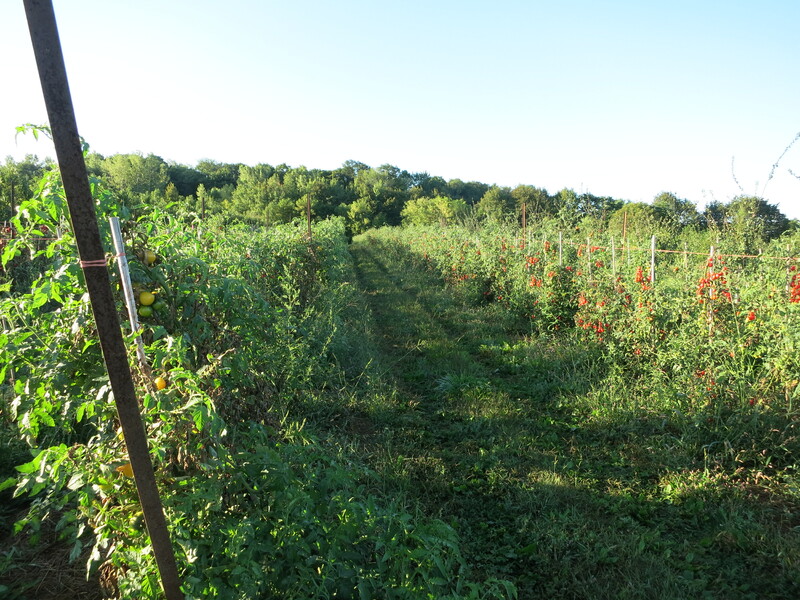 Tomatoes & sweet peppers are coming to an end along with the CSA. Enjoy the last of them! There are still hot peppers available. So many of you have said how delicious the Bartlett pears are. 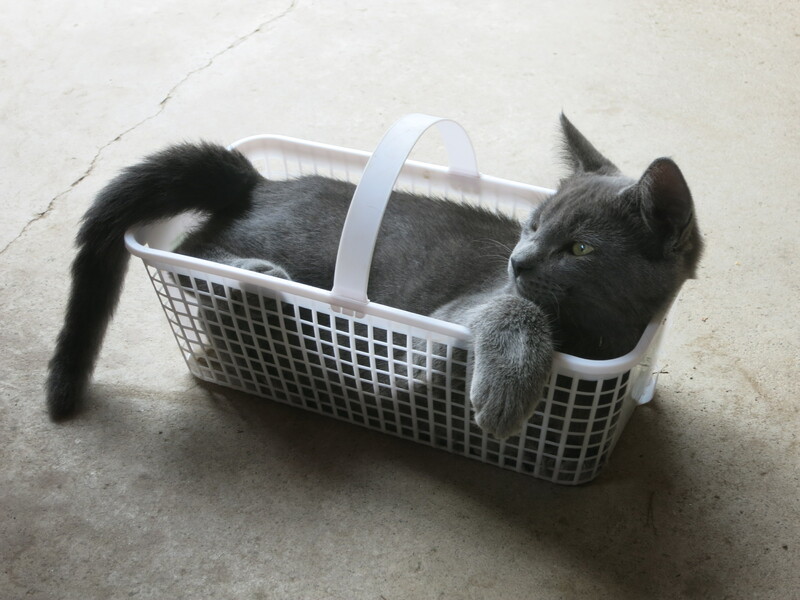 Grab another basket if you want more. 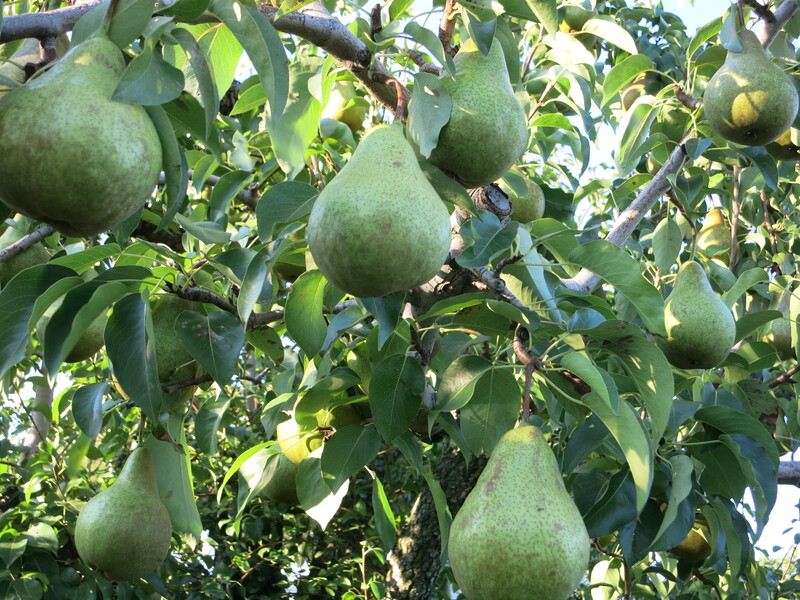 Eat them now while you wait for your Bosc pears to ripen. 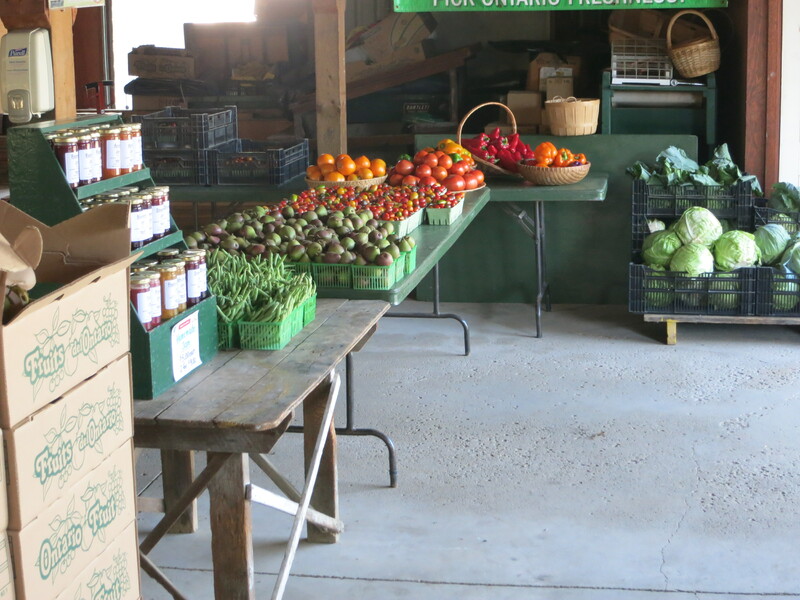 This is the final week of our CSA for this season! Thank you to all our members for being a part of this adventure in fresh eating! We hope you enjoyed all the vegetables & fruit. 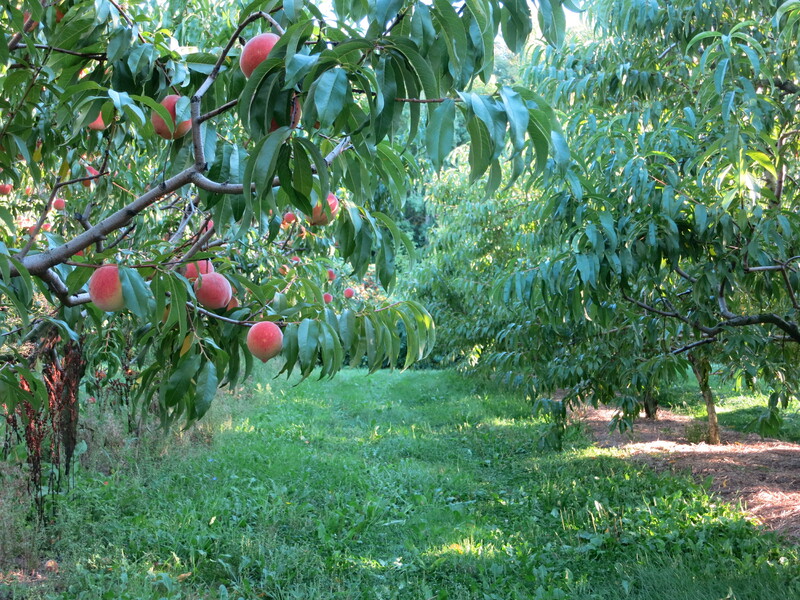 The orchards are empty – all the trees are picked. 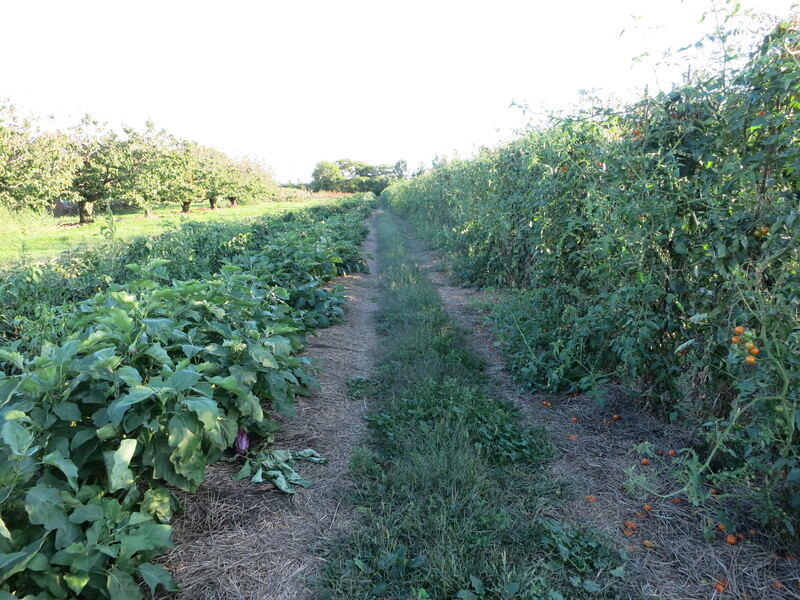 Many of the vegetables fields are empty too. Our last workers are leaving this week – one going home to Mexico, and one going to work at a greenhouse operation for a few months. 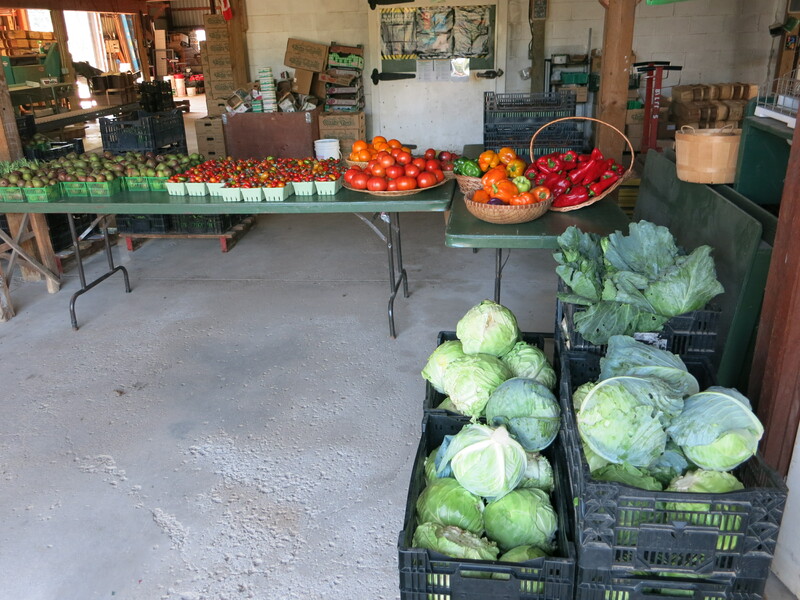 Our CSA program is wrapping up – only 1 more week after this one. But the season is not completely finished. 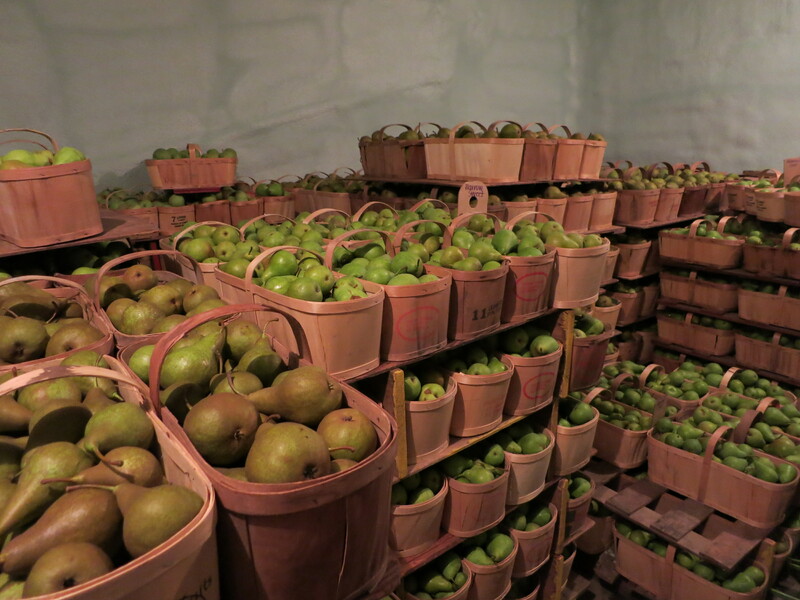 While the orchards are empty, the cold storage is full of pears to be packed. We are still picking some vegetables – tomatoes (mostly just some small cherries), eggplant (though the plants are going downhill fast), kale (still going strong), peppers (both sweet & hot continue to slowly ripen), and maybe some lettuce (here’s hoping the last planting will mature in time & still taste good). 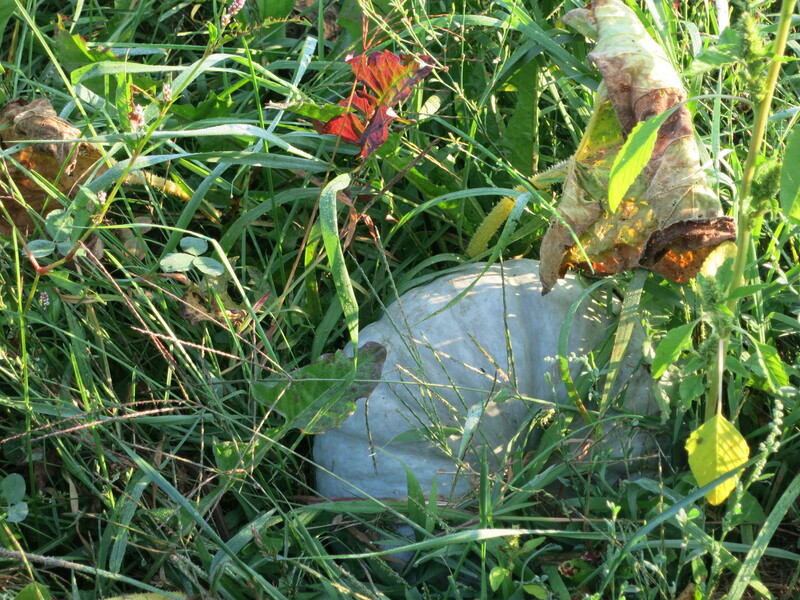 But our ambition & enthusiasm for harvesting is fading as fast (or faster) than the plants. 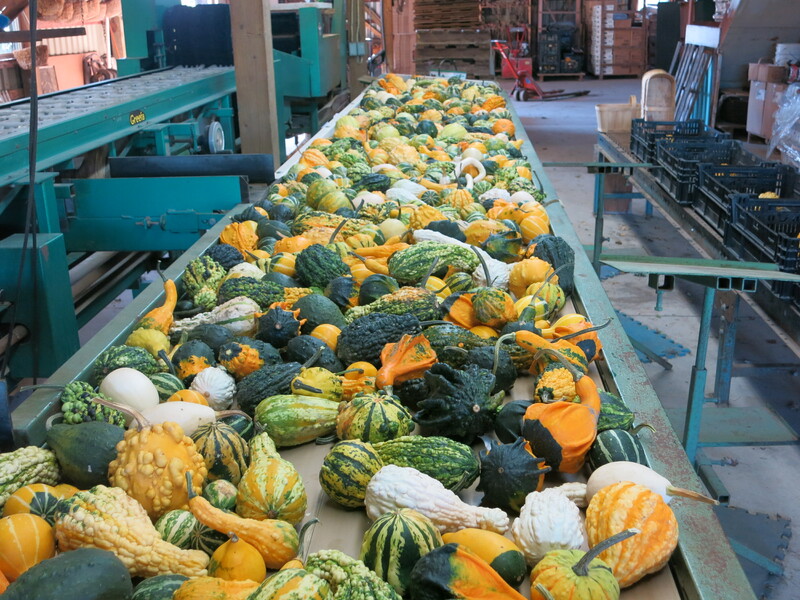 The squash & pumpkins are picked, but mostly still curing out in the fields & waiting to be hauled into the barn. 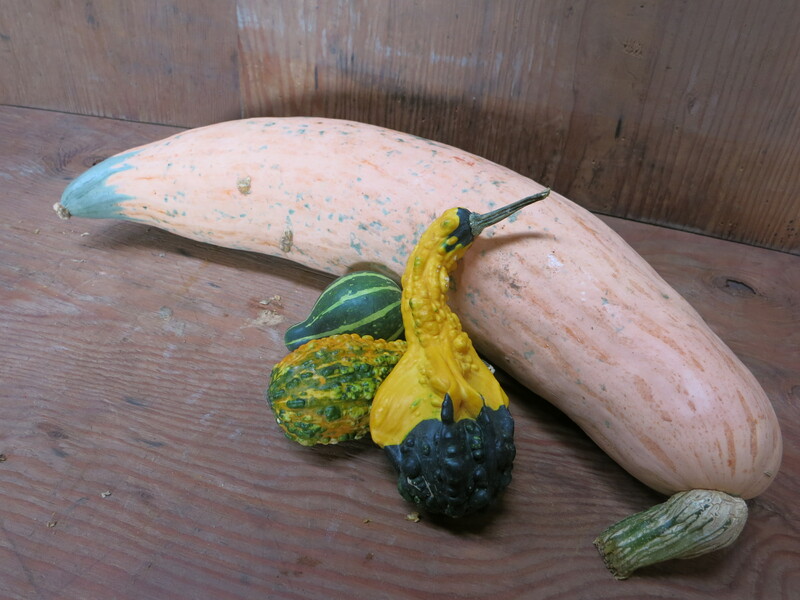 We washed the last of the gourds today – it’s time for fall decorating! Our market displays are very colourful this time of the year. 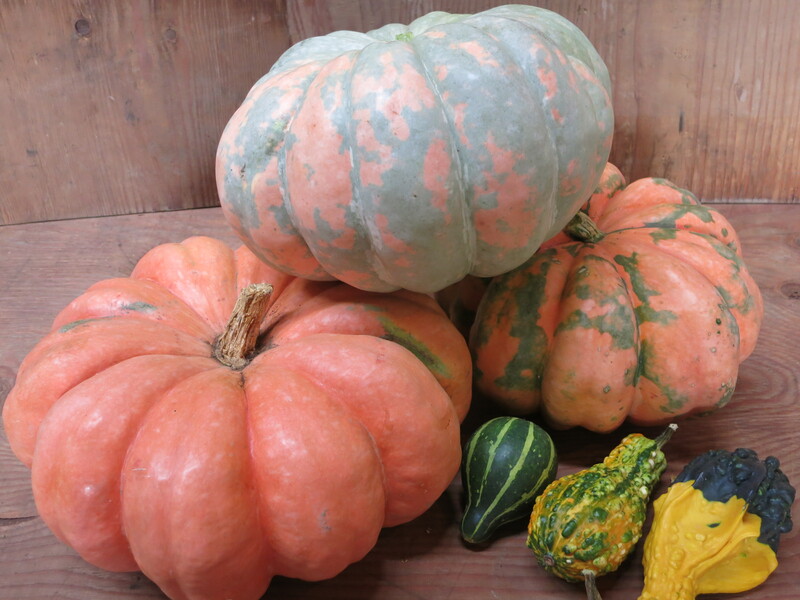 Although the CSA is finishing, but the farmers’ markets continue – one closes after Thanksgiving & the other goes right until the end of October. Our days begin a little later now as the sun is slower to rise in the morning. It sure was beautiful this morning! Squash, tomatoes, sweet peppers, garlic, kale, Bartlett pears. The first taste of squash will be in your box this week. Next week’s newsletter will have pictures & descriptions of the many kinds we grow. Some will be familiar & others are less common. 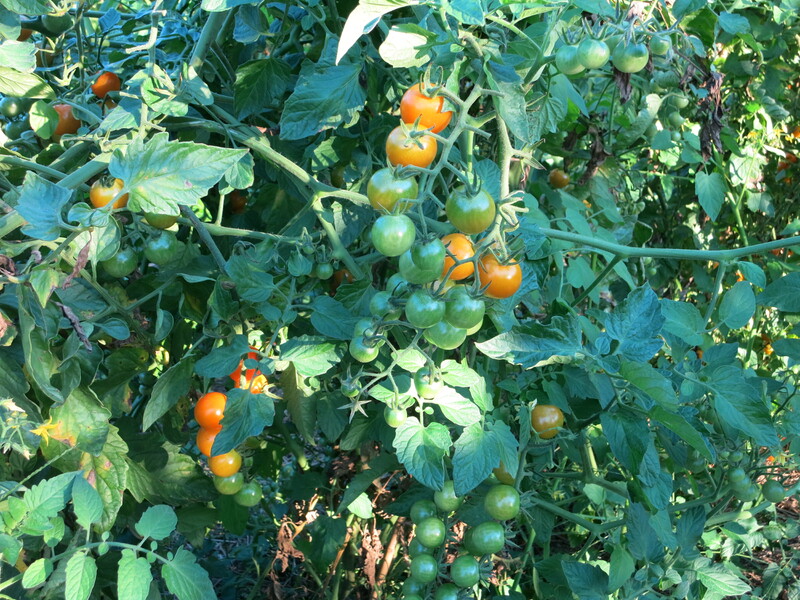 The cooler weather on the weekend immediately slowed down the ripening of the tomatoes & peppers. Enjoy them, as they are coming to an end. Another garlic bulb is part of your share this week. We have all the garlic trimmed & cleaned. Now we have to count out enough for planting & then we can see if there will be more for CSA next week or not? 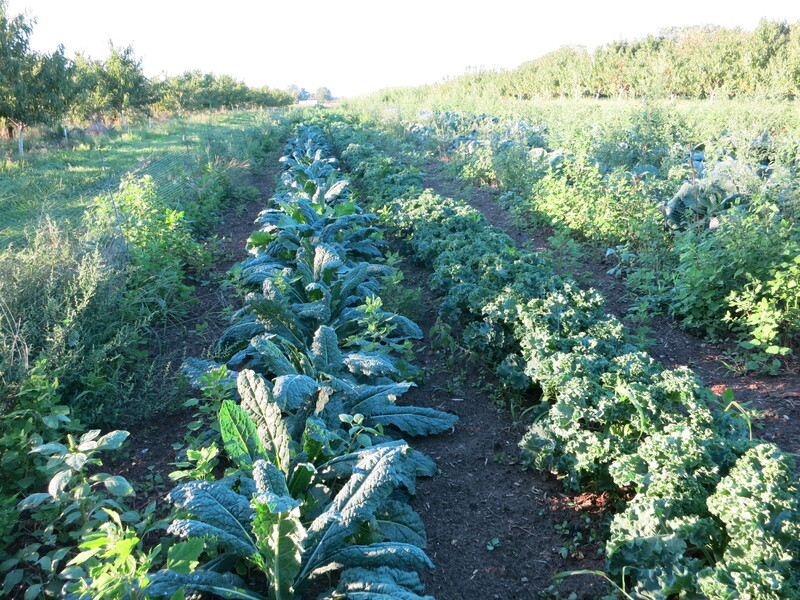 Kale is one crop that likes the cooler fall weather. It gets sweeter as the weather gets colder! Can you guess that there is an abundance of Bartlett pears this year! Your box will include another basket this week. 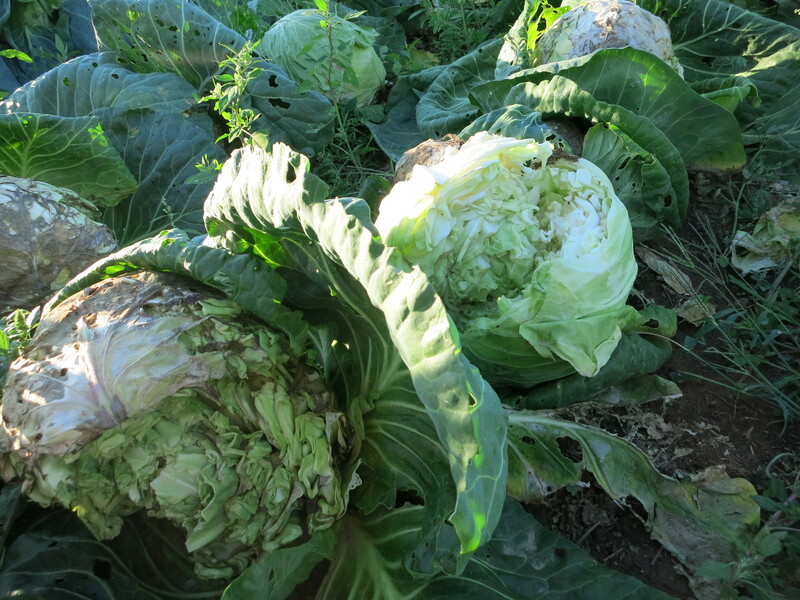 They will be greener & will last longer – especially if stored in the fridge. A selection of hot peppers will again be available for those who enjoy them. Only 1 more week left for CSA 2015! 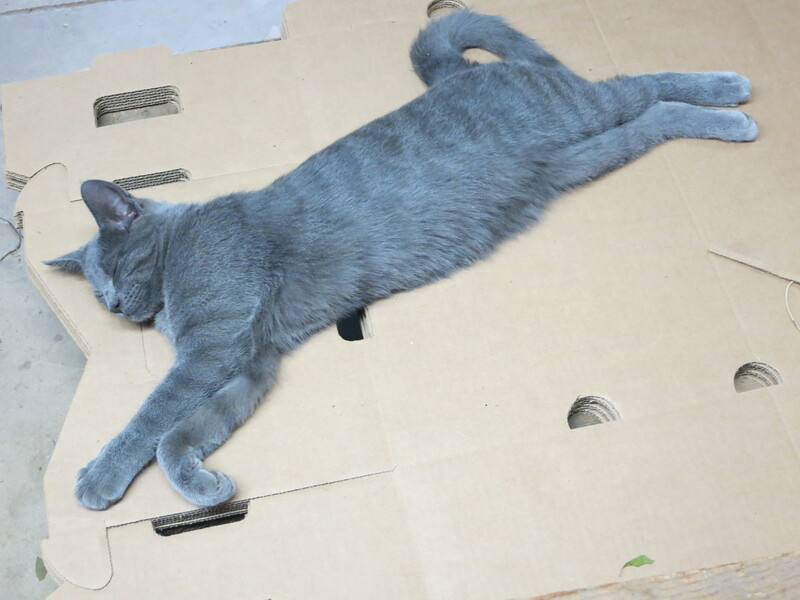 Today was labour day, and we certainly laboured – in the heat & humidity! The last of the Bartlett pears were picked today. 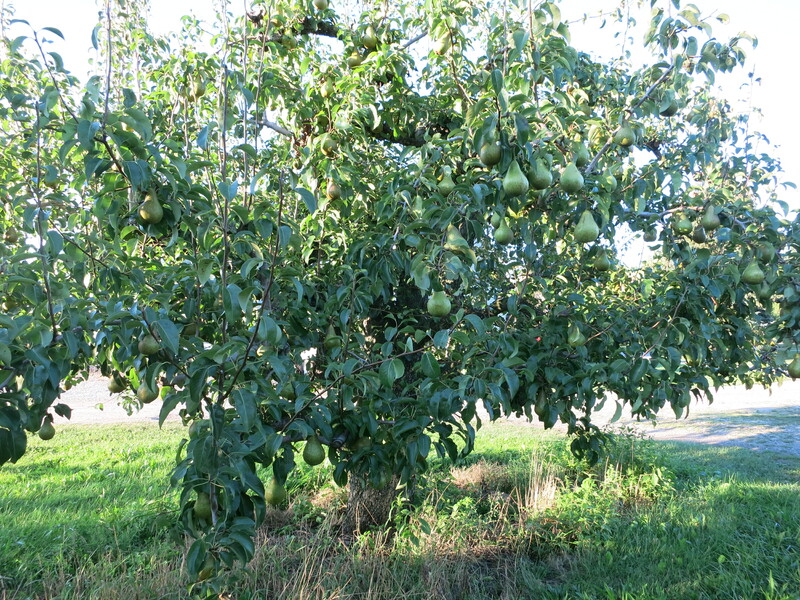 It was a good crop so there are lots of pears for our CSA shares, and to sell at the markets. 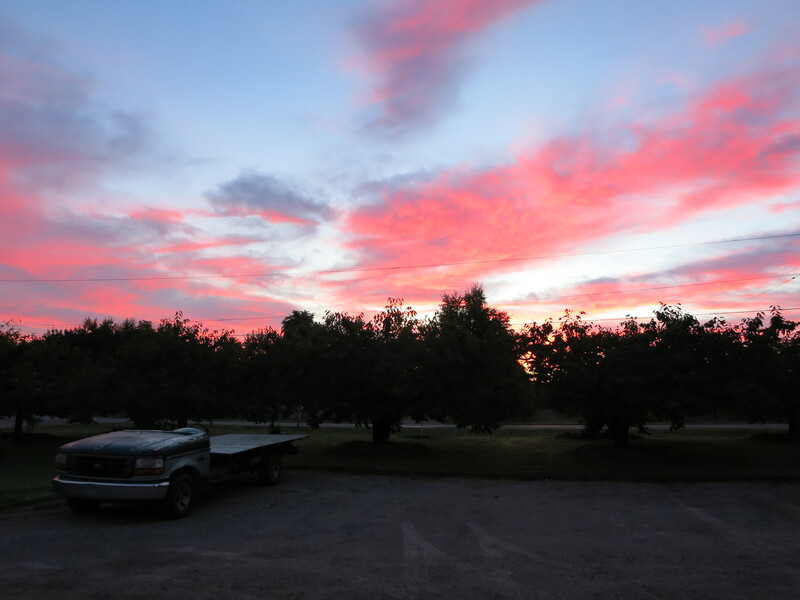 The Seckel pears are also picked. These are a very small pear compared to a Bartlett. 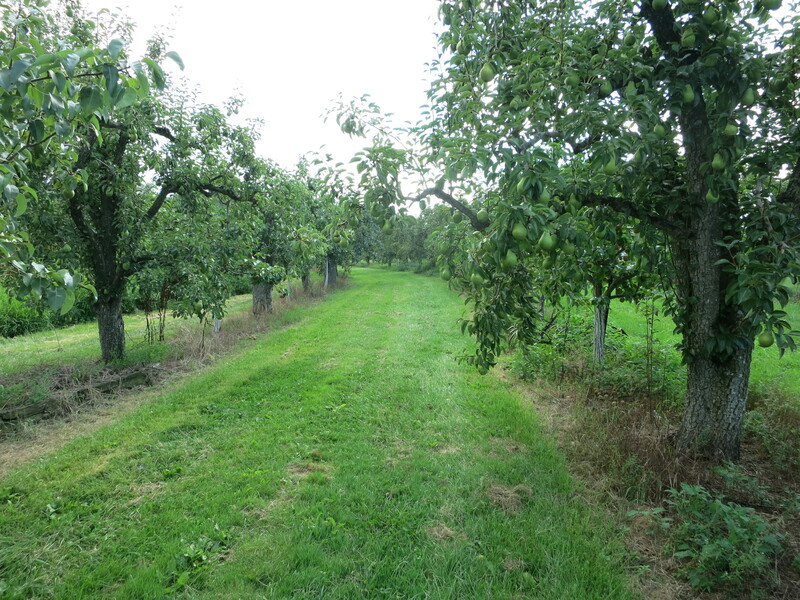 Pears are always picked rather green & hard, and then ripened once picked. A Bartlett will get sweeter & sweeter as it softens & turns yellow. A Seckel stays firm (it will never get soft), but tastes sweet – but probably not as sweet as the Bartlett. I continued to cut down sweet cherry trees today. 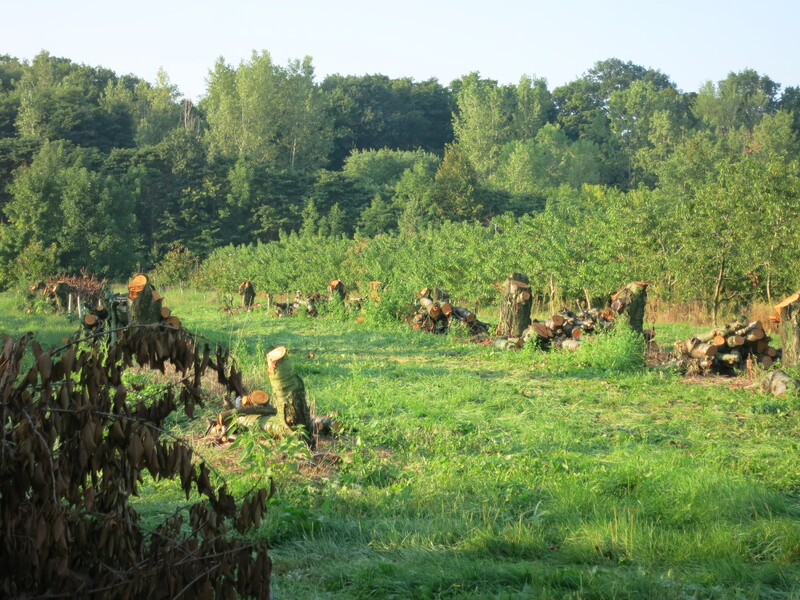 Once the trees are gone it gives the farm a whole new look – one that takes a bit of getting used to! 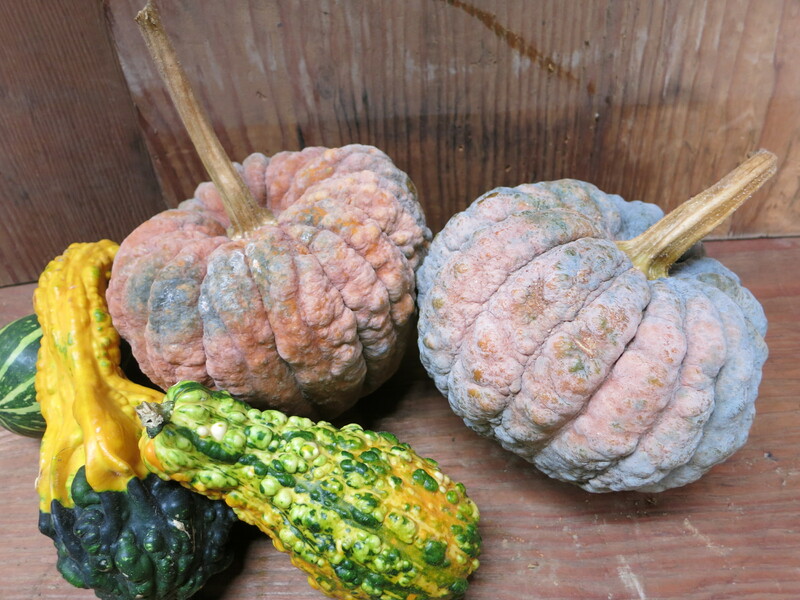 The heat & humidity cause an increase in mildew on the squash, gourds & pumpkin plants. 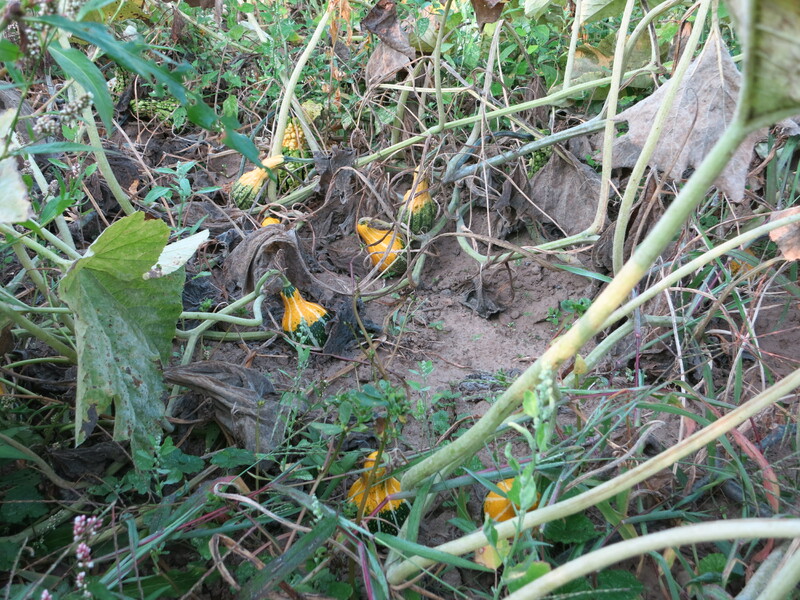 As their leaves get diseased and then dry up the squash is revealed, and we finally see what sort of crop there is. We will begin harvest in a week or so. Seckel pears, Bartlett pears, Damson plums, tomatoes, sweet peppers, garlic. Seckel pears (see brief description & picture above) are the perfect fruit for lunch boxes! Small, firm & tasty, they take up little room, are not easily bruised, and taste great! Bartlett pears are a favourite pear for many people! They are great for eating fresh, baking, cooking, jam, sauce … The pears in your box this week have been ripening in the barn for about a week already. Some will still be a bit firm while others are beginning to soften. We recommend you check them over. If you prefer a firm pear, store them in the fridge immediately. 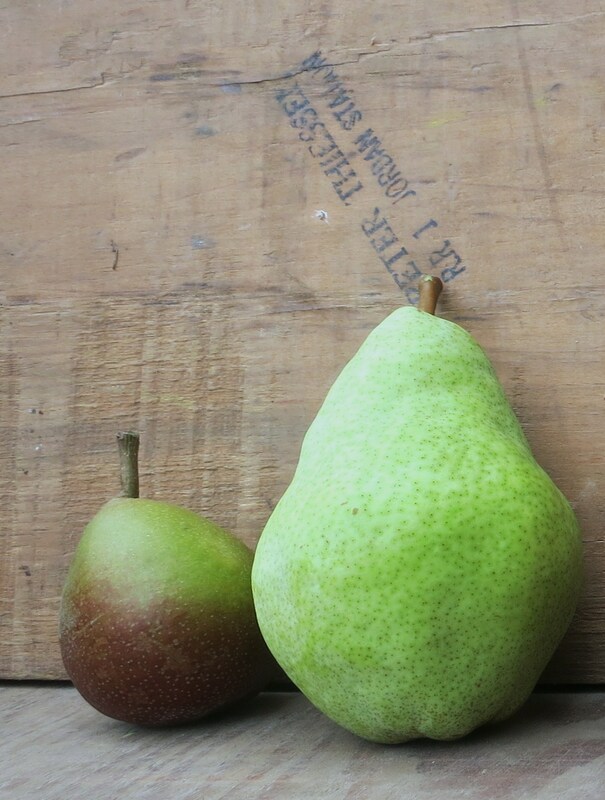 If a soft & yellow pear is your choice, let them sit out on the counter for a day or so – but keep your eye on them. Pears change from almost ripe to over-ripe very quickly! It may be better to keep them refrigerated & bring them out a day or so before you will eat them. The only plum variety that had much of a crop this season was the Damsons. In fact we’ve never had so many Damsons! They are a small, round, somewhat tart plum – especially amazing in jam or baking! But let them get slightly soft & they sweeten up & taste great. There will be some damsons in your CSA share this week. Give them a try & see how you like them! Along with the fruit, your box will also contain tomatoes, sweet peppers & a bulb of fresh garlic. The garlic is dried, so store it at room temperature in a dry place. It is not necessary to keep garlic in the fridge. Hot peppers are an extra again this week. Here is a Damson plum recipe that a customer from market recommended. She also brought us a sample – it was great!! 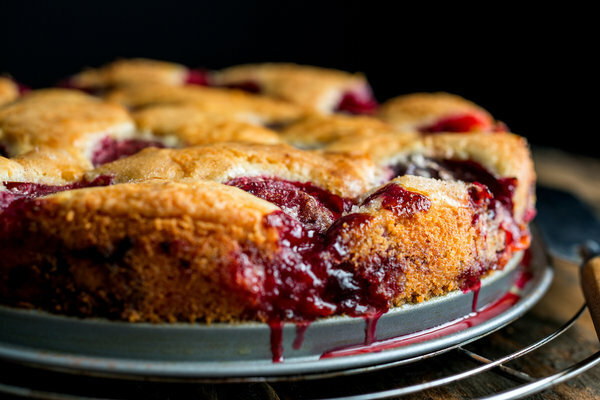 The Times published Marian Burros’s recipe for Plum Torte every September from 1982 until 1989, when the editors determined that enough was enough. The recipe was to be printed for the last time that year. “To counter anticipated protests,” Ms. Burros wrote a few years later, “the recipe was printed in larger type than usual with a broken-line border around it to encourage clipping.” It didn’t help. The paper was flooded with angry letters. “The appearance of the recipe, like the torte itself, is bittersweet,” wrote a reader in Tarrytown, N.Y. “Summer is leaving, fall is coming. That’s what your annual recipe is all about. Don’t be grumpy about it.” We are not! And we pledge that every year, as summer gives way to fall, we will make sure that the recipe is easily available to one and all. To freeze, double-wrap the tortes in foil, place in a plastic bag and seal. 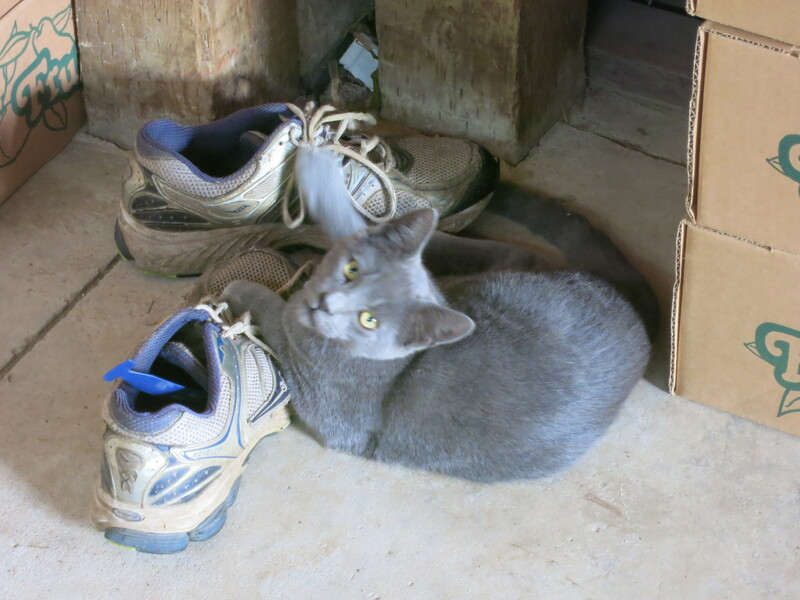 Not everyone was labouring today!